Kohl-rabi (Brassica caulorapa) is a low, stout biennial, closely related to cabbage. Unlike cabbage and cauliflower it does not form a "head" but is cultivated for the fleshy stem which is produced the first season. This originates above the cotyledons, is short, 3 or more inches in diameter, and grows just above the ground. This vegetable is grown chiefly as an early spring crop, since it does not thrive during the heat of summer. Seed of the Early White Vienna variety was sown Apr. 27, in rows 18 inches apart. Later the seedlings were thinned to 12 inches distant in the row. Early Development.--The first examination was made June 10. 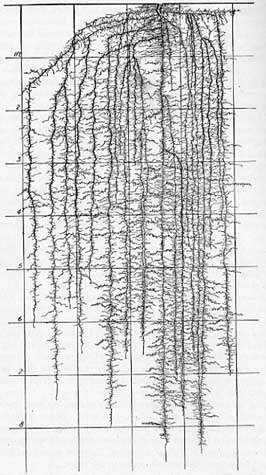 The plants were characterized by strong taproots and numerous, nearly horizontal, widely spreading laterals in the surface 8 inches of soil (Fig. 38). Several of the main roots ended at depths of 2.5 to 3 feet. Just below the soil surface the slightly thickened taproots were clothed with very numerous, short, unbranched laterals which formed a dense network. Usually about 20 larger roots also arose in the first 10 inches of soil. Some were only 6 inches long, many extended outward 1 to 1.5 feet, and a few of the longest (usually about 6 inches deep) spread laterally 3 feet. These larger roots were furnished with an abundance of short, mostly unbranched laterals. They averaged less than 1 inch in length and occurred at the rate of about 6 per inch of main root. Below 8 inches, branches were fewer, especially between 8 and 16 inches, and mostly less than 1 inch long, although a few exceeded 5 inches and were quite well rebranched. Growth proceeded rapidly. Fig. 38.--Early White Vienna kohl-rabi about 6 weeks old. Later Development.--A second examination was made 20 days later, June 30. The thickened portion of the stems had a diameter of approximately 3 inches. The plants were 1 foot tall and each had about 18 large leaves. The large transpiring surface is indicated by the fact that the leaf blades averaged 7 inches in length and 6 inches in width. During the 20-day interval the roots had grown considerably. Moreover, the number was greatly increased. Numerous counts showed that a typical plant had 81 nearly horizontal laterals in the surface inch of soil, 70 in the second inch, and 10 in the third. Between 4 and 9 inches they occurred at the rate of about 6 per inch. Although many of these did not exceed 3 to 6 inches in length, fully 20 per cent extended rather horizontally to greater distances, the longest having a total spread of 40 inches (Fig. 39). The larger laterals had diameters of 2 to 3 millimeters. Fig. 39.--Kohl-rabi 20 days older than shown in Fig. 38. Note the increase both in number and length of roots. Near the plant, i.e., for the first 4 to 8 inches of their course, the roots were extremely well branched, rootlets quite filling the soil. Branching was at the rate of 12 to 20 laterals per inch. They were 1 to 2 inches long and gave the main branches almost a woolly appearance. The major portion of the laterals was furnished with branches 0.2 to 1 inch in length at the rate of 4 to 8 per inch. Branches of the third order, although not long, were very common. The main laterals also had large branches which ran in various directions, very often toward the soil surface (Fig. 39). These were rebranched in a manner similar to that of the large roots. Thus the surface 10 inches of soil to a distance of at least 2 feet on all sides of the plant were well occupied by roots. Near the plant the roots occurred in dense masses forming a thread-like network. That the horizontal branches were rapidly growing was shown by their long, thick, unbranched ends. Below the 10-inch level only a few roots were found. Aside from the taproot these consisted of three to five of the obliquely descending laterals or horizontal ones which had spread 9 to 15 inches and then turned downward. The smooth, unbranched ends of these were usually found between the second- and thirdfoot level. Branching was abundant but not profuse. Between the 10- and 18-inch level the taproots usually had about five branches per inch. They varied considerably in their direction of growth but were seldom over 6 inches in length. At greater depths the roots became shorter (3 inches or less) but were moderately well rebranched to near the 3-foot level. Some of the taproots reached a depth of 4 feet. A study of the root system clearly showed that the bulk of absorption was still taking place in the surface soil. Tillage, except of the most superficial kind, would have been distinctly harmful to the roots. Mature Plants.--At the time of the final examination, Aug. 13, the plants had scarcely increased in size or number of leaves. The leaves were somewhat larger, however (about 10 inches long by 7 inches wide) and the fleshy portions of the stem now had a diameter of 4.5 to 5 inches. The underground part had made a remarkable growth, especially in depth. The lateral spread of any of the plants examined did not exceed that of the June examination. The fleshy tap-roots frequently measured 1.7 inches in diameter near the soil surface but tapered to about half this diameter or less at the 6-inch level. At greater depths they scarcely exceeded some of the larger laterals which were 6 to 10 millimeters in thickness. They pursued a vertically downward course to a maximum depth of 7 to 8.5 feet. This depth was also reached by a few of the rather vertically descending larger branches (Fig. 40). Fig. 40.--Root system of a nearly mature kohl-rabi. Branches on the fine lateral roots arising directly from the taproot are not shown. As at the earlier examinations, most of the larger branches arose from the first 10 inches of the taproot. In general, the roots here were of two sizes. There were small ones, usually less than 1 millimeter in diameter and only 1 to 6 inches long, and others distinctly larger and very extensive. They originated from two sides of the taproot. Frequently as many as 140 of the smaller laterals occurred on the first foot of the taproot. They were profusely rebranched with rather long laterals which were again rebranched. For the sake of clarity, the branches on these fine lateral roots have been omitted. The number of large laterals was variable, 6 to 10 being usual. They ranged from 2 to 10 millimeters in diameter. Usually they ran rather horizontally or obliquely outward 1 foot or more and then, turning downward, ended in the fifth to seventh foot of soil. Others turned more directly downward so that the entire soil volume below the plant was quite well occupied. As shown in the drawing, these large laterals often gave rise to strong branches. All these main roots as well as the taproot, which also gave rise to a few large laterals in the deeper soil, were profusely furnished with fine branchlets. They occurred at the rate of 5 to 10 or even more per inch and varied in length from 0. 1 to 8 inches. The longer ones, especially, were well rebranched. In general, the small branches of the first order were rather horizontal. They formed a close network in the soil to the working depth of 7 feet. The roots were all in good condition and growth was still taking place. Summary.--Young plants of kohl-rabi are characterized by a well-developed taproot and very numerous, shallow, but widely spreading, horizontal branches. In this respect it is very similar to cabbage. 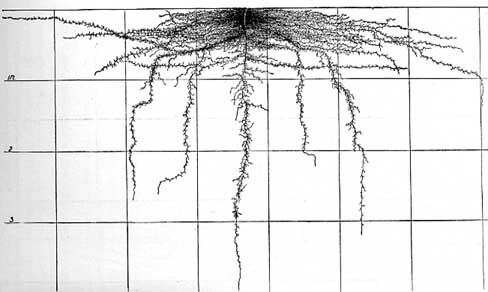 By July 1 the surface foot of soil 2 feet on all sides of the plant is ramified by a dense network of rootlets. A few obliquely descending rootlets and the taproot extend into the third or fourth foot of soil. In mature plants the taproot below a depth of 1 foot scarcely exceeds in importance the 6 to 10 major branches or even some of their laterals which, after running outward, parallel its course. Both taproot and branches reach depths of 5 to over 8 feet. All are profusely furnished with fine, rebranched laterals, often of considerable length. From the dense network of short, surface branches to the working level at 7 feet, the soil is thoroughly ramified. Other Investigations on Kohl-rabi.--Few investigations have been made on the root system of this plant. At Geneva, N. Y., the taproot of the Early Purple Vienna small variety was traced to a depth of more than 2 feet, having been followed through 14 inches of very compact clay. "Owing to the delicacy of the root we were unable to reach the end." 43 The horizontal roots extended 2 feet on all sides of the plant. As with cabbage and cauliflower, it was found that the fibrous roots were most numerous in the upper 8 inches of the soil. Investigations in Germany have shown that the main mass of the roots of kohl-rabi are in the upper soil layers, but in the varieties of cabbage examined the soil was thoroughly ramified to a depth of 39 inches. Lateral spread varied from 3.3 to 4 feet. 89 These observations were made in the main by means of plants grown in containers, although also aided by observations from plants growing in the open, the root systems of which were carefully washed from the soil. Although it seems clear that differences in subsoil conditions greatly affect the depth of root penetration, it is equally certain that the roots of this plant may penetrate deeply.